Our time tested growing, packing and shipping processes ensures that your Aloe polyphylla plants arrive to your location in healthy, pristine condition. Plants are shipped every Monday and Tuesday using UPS air or ground service making sure they arrive by the end of the week. 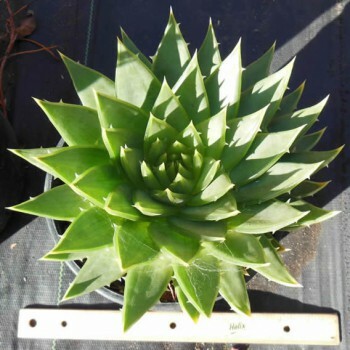 All orders include a sample of our best Aloe polyphylla planting medium and the Care & Cultivation guide. All plants are shipped on Mondays or Tuesdays only to ensure delivery by the end of that business week. When you make a purchase on our website you agree to make the necessary arrangements in order to take proper delivery of your order. You also agree that if after delivery your shipment is left out in excessive heat or cold the plant warranty may be voided. All plants we send out are thoroughly inspected and have a state of health enabling them to withstand shipment and perform satisfactorily for any new owner who follows the handling instructions. We will replace any plant that dies within 30 days of receipt. Customer is required to provide a photo with an email to advise. Customer agrees that minor cosmetic features on a plant have nothing to do with the plants’ future performance and alone do not constitute grounds for rejecting the plant. Brown tips and small leaf spots do not threaten the plants’ future and under new owner many new leaf will emerge in the next year. In fact it is rare to have a plant with > 35 leaf not show some brown leaf tips. We will then contact you within 1 business days to resolve your issue.